Meet “Tuxedo” who is an important team member at Kleinburg Veterinary Hospital. 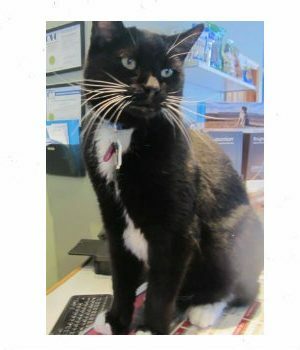 Tuxedo was brought to our clinic by a good Samaritan over 14 years ago. He had been hit by a car and was rushed in with a broken leg. We repaired his leg and he has been a member of our team ever since. Look for him to greet you at the desk when you arrive. In May 2018, Tuxedo will be 20 years old!